Today Sri Sri Radha Gopinath Mandir stands magnificently as part of the South Mumbai locale, but its beginning was very plain and humble. The seed was sown when the Trustees of the Lady Northcote Hindu Orphanage (LNHO), under the Chairmanship of Sri Arvind N. Mafatlal, invited devotees to help run the orphanage on the lines of traditional Gurukul system. Dr. N. D. Desai (H. G. Sri Nathji Das) was then the Managing Trustee of the LNHO. The Trustees gave ISKCON a small room at the back. A few devotees came to stay here in this small space with their meager belongings. Sri Sri Radha Gopinath were installed on July 17, 1988 in a grand function with more than 400 people attending the ceremony. It was fulfillment of the prophecy made by Srila Prabhupada. In 1971, when Srila Prabhupada was coming down the steps of the nearby Bharatiya Vidya Bhavan, he told his secretary Shyamasundar Prabhu, with his cane pointing towards this area where the temple presently stands, “We must have a temple here.” Sure enough, Lord Krishna fulfilled the desire of His Pure devotee. It was clear that the Yuga-avatar Lord Sri Chaitanya Mahaprabhu, and Lord Nityananda Prabhu would soon make Their appearance at the temple. Sure enough, Sri Sri Gaurachandra along with Sri Gopalji were formally installed in 1990. A deity of Srila Prabhupada was also installed as per ISKCON standards. 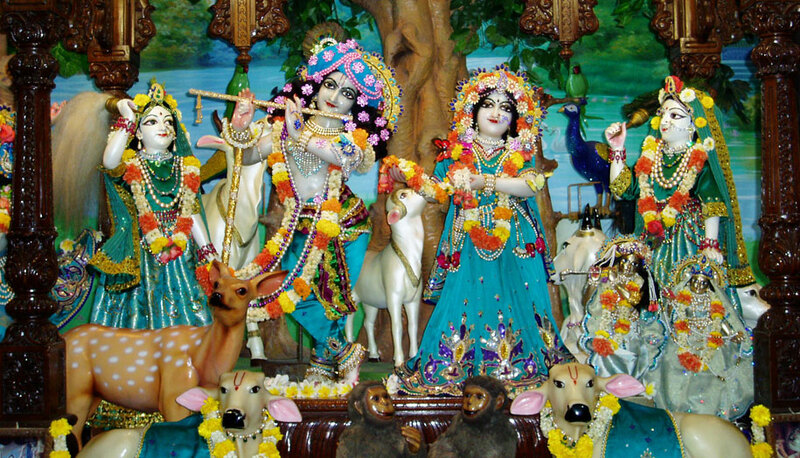 Then came cows, parrots, peacocks and monkeys on the altar and created an atmosphere permeated with the simplicity and sweetness of Vrindavan. Since then, the temple has undergone several stages of renovation. From laying a complete new foundation underneath the existing structure, to strengthening the wooden flooring of the temple hall with iron beams, to beautifying the exterior of the temple hall were also refurnished with beautiful Italian marble. Later, the altar and the whole temple hall were decorated with beautiful wooden carvings. On the ground floor, the Bhaktivedanta hall got a new flooring of white Makarana marble and the walls were covered with best quality teak veneer. The wooden flooring in the main temple hall has also been replaced with Burmese teak wood. The temple is also one of the very few in India to have an air-conditioned hall. The beautiful structure that we see today has developed through the hard work and dedication of several devotees. These devotees have worked tirelessly to fulfill the vision of H.H Radhanath Swami Maharaj who is steadfastly following the path and instructions given by Srila Prabhupada. And so, what started out as a simple room has been transformed now into a beautiful home for Their lordships, Sri Sri Radha Gopinath.